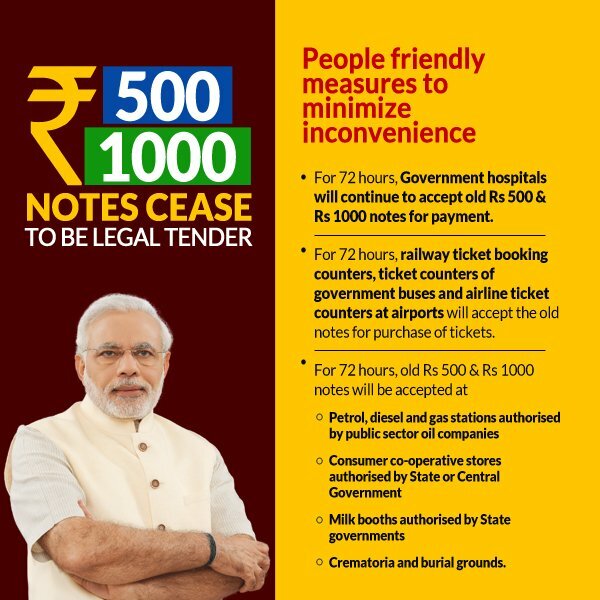 500 and 1000 rupee notes have been banned for good. No wonder Modi govt is working for the people. This is yet another step to improve our economy. In a one of its kind shocking announcement, Modi has announced a complete withdrawal of 500 and 1000 rupee denominations as legal tender. This has irked a lot of people, most of them however are fraudsters. This bold move announced by Modi is to curb black money from the country. It is a really effective means to reduce black money to some extent. Though it may not help in bringing black money from swiss banks, it certainly helps in reduced loose black money in India. Black money with fraudsters and corrupt people will become useless to some extent. They cant deposit in banks or post office as they have to be accounted. The ban of 1000 notes will help prevent counterfeit notes printed by Pakistan Terrorists. 2000 Notes with more security features. Also save space for huge transactions. Some people will learn doing transactions online. A move towards digital India. Since time frame is less to do mass deposits, most black money is left useless. No solid limitation on gold purchase as gold dealers may link some agreements. Black money can be used to purchase chunks of gold for more price. No ready to dispatch stock of new 500 notes will leave people from remote places with virtually no money. This will help limit black money in the form of liquid cash, not the ones in the name of benami’s or in swiss accounts. Mostly helpful in preventing future black money frauds as already most of the present black money will be diverted to gold and valuable investments. Though this scheme has been deemed as highly successful by most, its impact in my opinion will be moderate and not completely effect black money. So finally Modiji has given reply to his opposition by giving a plan to cut black money in circulation. Kudos to the Modi government!